Cheryl Felder celebrates United Methodist Women’s 150th anniversary hosted by the New England Conference United Methodist Women at Boston U. On March 23, 1869, eight women gathered at Tremont Street Methodist Episcopal Church in Boston and founded the Woman’s Foreign Missionary Society. On the same date in 2019, Methodist women marked the 150th anniversary of this organization, now known as United Methodist Women, with a celebration at Boston University hosted by the New England Conference United Methodist Women. United Methodist Women was founded less than three miles down the street, said emcee and New England Conference lay leader Rene Wilbur, speaking of the Tremont Street church, whose historical exterior has been preserved but which now houses luxury apartments. Boston University and its theological school has historic ties to the Woman’s Foreign Missionary Society, as attendees learned throughout the day. Dana Robert, professor and director of Boston School of Theology’s Center for Global Christianity and Mission, explained ties between the school and the women’s society during her presentation on United Methodist Women’s founders and New England Methodism. On the same day he chaired the first public meeting of the Woman’s Foreign Missionary Society in Boston on May 26, 1869, Massachusetts Governor William Claflin went to the state house and signed the charter for state legislature to found Boston University. “It was the same people,” said Robert. Speaking on United Methodist Women’s founding, she described a visit in March 1869 between Edwin and Lois Parker, missionaries in India who had returned on furlough to Boston, and William and Clementina Butler, founders of Methodism in India. “As the missionary couples chatted with women at the Tremont Street Methodist Episcopal Church, the oppression of women in India was on everyone’s minds,” she said. “Couldn’t women do something for their sisters in another part of the world? The day began with a welcome breakfast in the theology school community room and an invitation by Dean Mary Elizabeth Moore to tour Marsh Chapel and the school’s library, where now hangs stained-glass windows from Tremont Street church dedicated to the founders of the Woman’s Foreign Missionary Society. Two original hymns were written for the occasion, one by the Rev. Carl Daw Jr. titled “A Woman First the Tidings Spread” to commemorate the windows’ dedication, and a second titled “Two Pennies and a Prayer,” by Jill Colley Robinson, district superintendent for the Vermont District of the New England Conference. Lillie Searcy, executive director of the Hattie B. Cooper Community Center, a United Methodist Women-supported national mission institution in Roxbury, Massachusetts, and representatives from United Methodist Women partner United for a Fair Economy, based in Boston, also joined the event. Thomas Kemper, General Secretary of the United Methodist General Board of Global Ministries, also attended, and offered greetings on behalf of Global Ministries and spoke of the agency’s and church’s history with women’s mission work. That women raised their own funds for their own work is key to the success and longevity of United Methodist Women. Other speakers included event chair Leeda Marsh, New England Conference historian Patricia Thompson and New England Conference Bishop Sudarshana Devadhar. The topics discussed included the Tremont Street Methodist Episcopal Church and its windows, the Hattie B. Cooper Community Center, the New England Deaconess Home and Training School, the Boston Immigrant Home, the founding women, and the impact of missionaries. 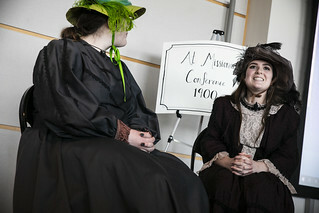 Two skits were performed, telling the stories of Woman’s Foreign Missionary founders Clementina Butler and Lois Parker and of Isabella Thoburn and Dr. Clara Swain, the society’s first two missionaries. During lunch, attendees heard from Rita Smith, president of the North Central Jurisdiction United Methodist Women; Andrea Reily Rocha Soares, United Methodist Women regional missionary for Latin America; Susan Kim, member of the United Methodist Women Racial Justice Charter Support Team; and K Stone, president of the El Camino Real District United Methodist Women in California, who all shared what brought them to United Methodist Women and what being a part of the organization means to them. “What a wonderful background our history provides for talking about the future of United Methodist Women,” said United Methodist Women General Secretary and CEO Harriett Jane Olson, who spoke of the future of the organization. The history is a foundation, she said. It shapes us. “But the future of United Methodist Women is what we make it. Olson shared the example of Belle Harris Bennett, who as a young woman went to the Woman's Board of Foreign Missions of the Methodist Episcopal Church, South, to share her desire for women to receive training and equipping to do the work God called them to do. She was nervous. The chair of the meeting not only invited Harris into the gathering but invited her to sit right next to her and share what was on her heart. Speaking on the organization’s long history of prayer, she invited United Methodist Women members to invest themselves in the work of prayer. “The prayers of United Methodist Women were very much in evidence at General Conference. We really felt your presence because of the prayer shawls. An invitation 40 days before the conference resulted in more than 600 prayer shawls. Your prayer wraps all the work that we do." Like its predecessors, United Methodist Women continues offering education that transforms members and the world. “United Methodist Women will keep being about the work of learning, learning to see the world and learning to read the Bible with one another.” We go to Mission u, she said, not just to have data inputted into our brains but “to have our hearts expanded, to engage our own experience and to engage with the experience of our sisters around the room so that we can become better prepared to follow God in the world. The voices of the marginalized have always informed United Methodist Women’s work. “United Methodist Women in the future must continue to be an inclusive and welcoming space. We think about that in the people we invite. Inclusive of all ages, of racial and ethnic differences, of first language differences, of mobility differences, socioeconomic status, and inclusive in differences of sexual orientation. “In the wake of General Conference, where the church has been debating how to welcome LGBTQIA members, United Methodist Women’s work is to lift up and stand beside our LGBTQIA siblings who are already a part of the work, who are shaping us as the movement shapes us all. Our organization is not and has never been of one mind, Olson explained, but it is committed to working together. Those elections are happening soon, and some may be closed, Olson pointed out, but members can also be nominated from the floor of annual conference. “I’m inviting you to choose to be in the building. We have access. Now is the time to use it,” she said. You can watch the video of the event on the New England Conference website at neumc.org/umw150, and you can see more coverage on the United Methodist Women Twitter feed at twitter.com/UMWomen. Click here to give to the Legacy Fund to celebrate 150 years of United Methodist Women. "United Methodist Women: 150 Years in Mission"
"A Day to Celebrate United Methodist Women"